This week at 52CCT, the Design Team is looking at the way you colour your cards. I love using Copic Markers. It is amazing some of the things you can do with these markers. I am by no means an expert. For inspiration of what you can do with Copic markers, I would strongly advise you to check out Sandy Allnock. This lady can Rock Copic Markers! For my card, I used an adorable Bird Brain digi stamp by From the Heart Stamps (unfortunately this company is closed). I coloured it with Copics and die cut it was a circle die by MFT. I folded a piece of blue cardstock 10″ x 5″ and cut the same size circle so I ended up with a card with a circle in the centre. Next, I glued the image into the inside of the card. For the final touch, I added a die cut from Find It Trading – Precious Marieke Die – Spirit of Christmas Snowflake Circle. Join us every week for a new Christmas Card Challenge! Hiding in my Craft room - HIMCR #371 – Any Holiday! Welcome to the 2018 52 Christmas Card Throwdown first challenge of the month and year! 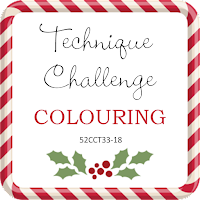 Andreja has designed a fun sketch challenge for us and it is never too early to start your Christmas cards! Besides….it is really fun! For this challenge, I started by printing my digital stamp from A Day for Daisies - Fuzzy Bunnies. I used my Copic markers to add just a hint of colour. Next, I used an embossing folder (retired) from Stampin Up – Northern Flurries. The sentiment Joy is a Penny Black diecut. My card design is a 5 x 7, so I created the background using some cardstock I had on hand. I created a fishtailed banner in a matching blue to place behind the bunnies card and added it to the card front. For the finishing touches, I added a snowflake button and a few gems. We are running our challenges weekly, so you will have lots of opportunities to join us making cards for your friends and family. 130 Christmas Cards for Seniors! Every year I make 130 Christmas cards for the Belmont Long Term Care Home. It is my way of paying it forward for the fabulous care they provided my mother. I love to colour while watch TV so I will stamp numerous images and hand colour them with Copic Markers, Zig Water Colour Brushes, Derwent Inktenses Pencils, or Distress inks. Once I get a number completed, I then sit down and start to assemble my cards. No two cards are the same, While I may use the same image, I colour them differently, use a different card format, different card stock, etc. I also make Fall/Thanksgiving/Halloween, Easter/Spring, Valentine’s Day, Remembrance Day (for the veterans), plus birthday cards. It keeps me busy, and I really enjoy it. I also make cards for myself and friends. I dropped the cards off for distribution on December 1, 2016.